The SMH has an article opining that prospects for US shale oil production are fading - US shale boom starts to fade. For the past three years, the boom in the US shale oil industry has outstripped all expectations. Production surged far faster than any forecasts; drillers raced to secure space in new pipelines to get their crude to market. Now, at the periphery, that may be changing - at least for a while. News from two of the country's less developed shale plays in Colorado and Ohio last week offer a reality check for the wave of euphoria that has washed across the industry. The stumbles mark a break from the past few years, when nearly every new project was an overnight success and output grew and grew. On Thursday, Ohio, home to the Utica shale, finally released annual data on 2012 production that showed the state pumped less than 700,000 barrels of oil from its shale wells -- barely enough to fill a small oil tanker. North Dakota's Bakken shale pumps more than that every day. Even state officials said it the result was "lower than initially estimated." The day before, NuStar Energy LP had said it would shelve a plan to reverse a pair of underused refined products pipelines to ship crude from Colorado's Niobrara shale oil play to Texas. It failed, twice, to garner enough commitments from potential customers to justify investing in the conversion. Neither development was a surprise to industry experts, and both were likely affected by extenuating circumstances. A growing preference for rail shipments likely dimmed interest in long-term commitments to use NuStar's pipeline. Ohio's shale may yet offer up large volumes of liquid gas and condensate, if drillers can find new ways to coax it out. Yet taken together they offered a sign that the flush of enthusiasm and rush of investment that piled into shale fields from one coast to the other has hit a curve. While the basic technologies of hydraulic fracturing and horizontal drilling was enough to coax an unexpected gusher of oil from shale rock in many regions, these more challenging seams may require incremental innovation to unlock. Platts has an article boosting the prospects for the shale industry finding more plays like the Eagle Ford in Texas - Did the shale revolution already find its biggest oil field at the Eagle Ford?. But one other thing Credit Suisse said, which echoes the sentiments of many in the industry, was that it was “skeptical” a new large field on the order of the Eagle Ford Shale in South Texas would happen. The Eagle Ford is one of the most prolific shale fields which boasts an estimated 943,000 b/d of liquids production and is forecast to produce 1.6 million b/d by late 2018. Instead, Credit Suisse said existing areas with “stacked” pay targets — i.e., layered formations –are better bets right now. When you consider how far industry has come in the last five years alone, it seems almost reactionary to make such a statement. And Credit Suisse is far from alone in that view: many executives share it — even from top shale producers. The Oil Drum has a skeptical look at the endless treadmill of drilling that shale oil / gas extraction requires- Is the Typical NDIC Bakken Tight Oil Well a Sales Pitch?. If the “Typical Bakken Well” is what NDIC recently has presented, total production from Bakken (the portion that lies in North Dakota) should have been around 1.1 Mb/d in February 2013. 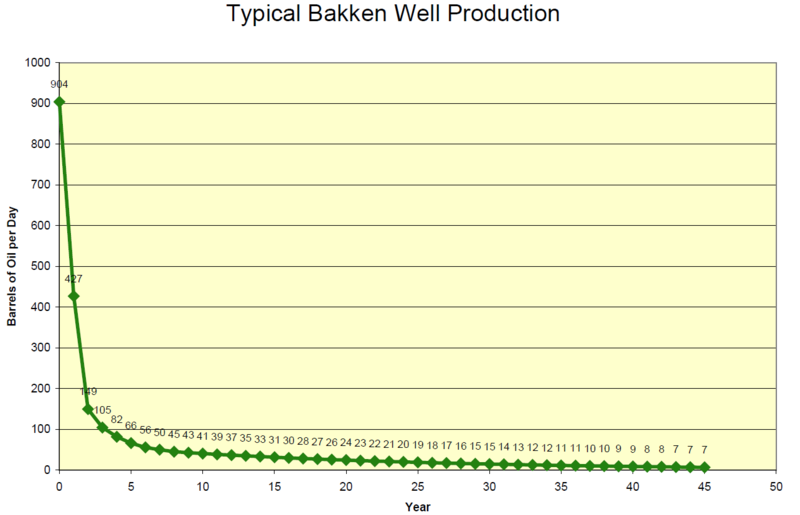 The production developments in Bakken and other tight oil plays are very much a function of monthly additions of producing wells, developments in well productivity, decline rates (for the growing population of “older” producing wells), development in costs, strategies deployed by the companies for development of their acreage, adequate infrastructure and not least the developments/expectations for the oil price.